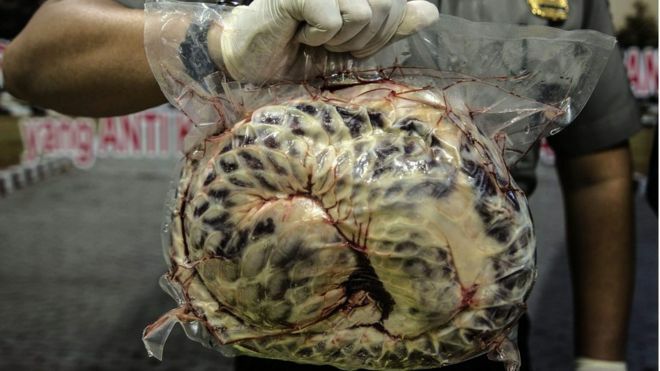 Indonesian authorities have seized more than 650 dead pangolins hidden in freezers and arrested a man. The critically endangered species is a delicacy in parts of Asia and is used in traditional medicine. Police found the animals when they raided a house in Jombang district on the main island of Java, after neighbours became suspicious about the number of freezers at the property. The 55-year-old house owner has been arrested as a suspect. He could face five years in prison and a fine of 100m rupiah ($7,500) for breaking wildlife protection laws. The pangolins were found wrapped in plastic and stored in five large freezers, East Java province police spokesman Raden Prabowo Argo Yuwono told news agency AFP. Pangolins, known as “scaly anteaters”, are used in parts of Asia for their meat, skin and scales. The International Union for Conservation of Nature classifies the pangolin species found in Indonesia as critically endangered.